Buying or Selling Gold, Silver or Platinum Coins? 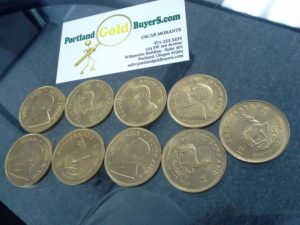 At Portland Gold Buyers, LLC we deal with precious metals every day. If want to buy or sell Gold, Silver, Platinum or Palladium coins, we are ready to help you. Most likely one of the top search engine results will be Portland Gold Buyers, LLC. 971-222-3435. This is our company. The only person to deal with is Oscar Morante, the owner. Oscar Morante will answer your call very soon. Tell him what kind of coins you have, and how many of each. We buy all quantities and sizes of gold, silver and platinum coins. So we will make you an offer. We will make you the best offer we can for your precious metals. Most likely you will like our offer for your gold and silver. If the offer works for you, bring your gold and silver to our office. We are easy to find. We are located in at the Willamette Building, which is the building at the North East corner of SW 3rd and SW Alder, in the 3rd floor. You can see the Portland Gold Buyer, LLC “Gold” neon gold signs at the third floor level of the building. You can’t miss it. Every day thousands of people see our “Gold” signs. Come up the third floor. As soon as the elevator door opens, you will see the gate of Portland Gold Buyers, LLC. Oscar will attend you. Once in the office, show Oscar your gold coins, silver coins and platinum coins. If you have additional precious metals, such as jewelry, we buy that too. Oscar will evaluate the precious metal items you want to sell and make you an offer. Most likely you will be happy with our proposition. We always pay the most we can for precious metals. Gold, Silver, Platinum and Palladium are always very valuable. So even when the market is low, it is always amazing how much in dollars does a little bit of precious metals can fetch. If you want to complete the transaction, Oscar will immediately pay you cash. We buy all the gold, silver, platinum and palladium coins. Below is a partial list of we buy and sell.